ww2dbaseHearing the news of success of Operation Dragoon landings in southern France, the French started to stage general strikes as early as 15 Aug 1944. Three days later, barricades began to be set up around the city, and fighting between French fighters and German troops climaxed on 22 Aug. The fighting eventually led to the loss of 1,500 resistance fighters and civilian lives. Even though the Allies had long avoided bombing the French capital, morale of German General Dietrich von Choltitz's troops were low, demoralized from the tales of the rapid Allied advance from the Normandy region. ww2dbaseGeneral Dwight Eisenhower, the American commander of all Allied forces in Europe, was initially adamant against taking Paris. Being a military commander, he avoided the possibility of having to set up an civilian administration to deal with the city's population while he also had a war to carry out. He originally planned to besiege, but not attack, Paris, letting its defenses fall as Germany was defeated; he would only enter the city, he noted later, if he detected major starvation among the Paris population as a result of the siege. Free French leader General Charles de Gaulle, however, had a different view. He demanded intervention, threatening to break away from Eisenhower's command and attempt to take Paris on his own should Eisenhower continue to avoid the French capital. In the interest of harmony among top Allied leaders, Eisenhower caved in to de Gaulle's demands; after all, the general uprising of resistance fighters in the city, if anything like the effective counterparts in Brittany, should make the task a bit easier while minimizing damage to property and lives. ww2dbaseEisenhower gave the task of taking Paris to General Omar Bradley, who chose to use French General Jacque Leclerc's Second Armored Division to make contact with the German garrison in Paris. The French Second Armored Division was a veteran unit from the North African campaign, and most importantly politically, French in ethnicity. The American Fourth Division was also dispatched to assist, together with a British contingent. ww2dbaseAgainst Adolf Hitler's specific orders, von Choltitz chose not to fight for Paris. He began evacuating the city in secret before the Allies arrived, as observed by Allied intelligence. On 23 Aug, elements of the US Army 102nd Cavalry Reconnaissance Squadron rode ahead of French tanks, and reached the outskirts of Paris by the evening of 24 Aug. Noting that the light German resistance had been eliminated, the cavalry made way for the French troops, which entered the city at dawn of 25 Aug. Just behind them were American troops from the 12th Infantry Regiment, which arrived at Notre Dame by 0830. By 1530, Allied troops were gathered at the Arc de Triomphe. The official unit history of the US Army 38th Cavalry Reconnaissance Squadron, which entered the city ahead of the 12th Infantry Regiment, noted that the men "received uninhibited and enthusiastic greetings of the Parisienes and Parisiennes,... Morale was never higher." ww2dbaseWhy should we try to hide our emotion which we all of us here, men and women, feel? We are back home in Paris which is on its feet to liberate itself and which has been able to achieve it singlehanded. No, we should not try to conceal this profound and sacred emotion. We are living through moments which transcend each of our poor lives. ww2dbaseParis! Outraged Paris! Broken Paris! Martyred Paris, but liberated Paris! Liberated by the people of Paris with help from the armies of France, with the help and support of the whole of France, of France which is fighting, of the only France, the real France, eternal France. ww2dbaseBecause the enemy which held Paris has capitulated to us France goes home to Paris. She goes home bloody but very resolute. She goes home wiser from the tremendous lesson she has learned, but more sure than ever before of her duties and her rights. ww2dbaseI put duties first and I would include them all if, at the moment, I said her warlike duties. The enemy totters but is not yet beaten. He remains on our soil. It would not even be enough, after what has happened, if with the help of our dear and admirable allies we chased him out of our country. We want to go to his country as we should, as conquerors. This is why the French advance guard reached Paris with cannon shots. This is why a great French army from Italy landed in the South and is advancing rapidly up the Rhone valley. This is why our courageous and dear Forces of the Interior are going to be armed with modern weapons. It is for revenge for revenge and justice that we shall continue to fight to the last day until the day when victory is total and complete. All the men who are here today and all who hear me elsewhere in France know that this warlike duty demands national unity. ww2dbaseIn the present situation the nation would not allow national unity to be disrupted. The nation well knows that to conquer, to reconstruct and to be great all Frenchmen are needed. The nation well knows that the sons and daughters of France - all the sons and daughters except for a few unhappy traitors who gave themselves over to the enemy and who are tasting or will taste the rigours of the law - yes! All the sons and daughters of France must march towards France's goal, fraternally and hand in hand. ww2dbaseActing as the ruler of Paris, de Gaulle requested two American division to remain in Paris to assist him in maintaining order. Arriving in Paris on 27 Aug, Eisenhower understood de Gaulle's needs but could not spare the men necessary from the front. Instead, what the American Supreme Commander did was that he marched the American 28th Infantry Division through Paris, and led the troops eastward to the front lines. "Because this ceremonial march coincided exactly with the local battle plan", Eisenhower recalled in his memoirs, "it became possibly the only instance in history of troops marching in parade through the capital of a great country to participate in pitched battle on the same day." General Bradley stood by de Gaulle on the review stand during the victory parades to symbolize American contributions to the liberation of France. ww2dbaseSources: Crusade in Europe, Steeds of Steel, Wikipedia. 10 Aug 1944 The railwaymen of Paris, France went on strike, and hundreds of soldiers awaiting evacuation back to Germany found themselves marooned on station platforms. The acts of random sabotage quickly escalated and within two days, instead of carrying the Germans away from the perils of Paris, the strikers were actively cutting off the German retreat by pulling up rails, wrecking points and crippling locomotives. Even with replacement German drivers the trains were unable to run and all Parisian rail links to the outside world had been effectively destroyed. 19 Aug 1944 In Paris, France Raoul Nordling, the Swedish Consul-General went to General Dietrich Choltitz, military Commander of Paris, with a proposal to barter 600 Germans captured by the Resistance for 4,213 French prisoners held by the Germans in the Paris area. This was something of a showpiece exchange designed to impress Berlin, for the French prisoners not only vastly outnumbered the German captives but, unlike them, were to be released immediately. Outside the city, American troops began to reach the Seine River. 20 Aug 1944 US 79th Division reached Seine River above Paris, France. 21 Aug 1944 US Third Army reached Reims and Troyes southeast of Paris, France. 22 Aug 1944 Adolf Hitler ordered the destruction of Paris, France on the following day. 22 Aug 1944 Having been convinced by Charles de Gaulle two days prior that Paris, France must be captured with haste, Dwight Eisenhower traveled to Omar Bradley's headquarters to discuss the logistics. 23 Aug 1944 Allied troops reached the Seine River near Paris, France. Adolf Hitler ordered all bridges in the Paris area to be destroyed, even those viewed as cultural treasures; Hans Speidel would refuse to carry out this order. 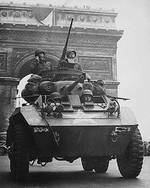 25 Aug 1944 The French 2nd Armoured Division entered Paris, France. De Gaulle moved his headquarters into the War Ministry in Paris on the same day with the approval of Eisenhower. 26 Aug 1944 A German air raid on Paris, France destroyed several residential neighborhoods. To the east, Allied troops crossed the Seine River. The famous US writer, Ernest Hemingway, would swashbuckle his way through World War II in much the same fashion as he had done in numerous conflicts before. Hemingway was not one of those pressmen who were happy to sit far behing the battlefield simply basing their reports on the Armys official communiques. He would regularly get heavily involved with the men at the front, often making things happen, and then writing his own experiences of events. When in August 1944, with the Allied armies poised to move into Paris, Hemingway became slightly frustrated at the delay in entering the French capital. Borrowing a car he drove unprotected into Paris a whole day before the official liberators. In fact he could have been beaten into Paris by another War correspondent, Sam White of the Evening Standard, but the latter decided to personnally liberate the famous French brasserie La Coupole instead. Sam White (1913–1988) was a foreign correspondent who worked for the London Evening Standard in Paris. He was born in Ukraine, and grew up in Australia where he was a member of the Communist party as a student. He is most famous for working at the Crillon Bar. He wrote a book on Charles de Gaulle (De Gaulle, ISBN 0-245-54213-2, 1984).